An analytic representation in finite quantum systems [1-7] which is represents a state in d-dimensional Hilbert space. Various analytic representations [8-11] have been studied in quantum mechanics. The most popular analytic representation is the Bargmann representation in the complex plane for the harmonic oscillator [12-14], One of the most important aspect in the theory of analytic functions [15-18] are zeros and the paths of the zeros [19-21]. In d-dimensional Hilbert space, the zeros define the state uniquely. The zeros of analytic functions in a square cell S is equal to d and the zeros obey a constraint [22-24]. So far periodic Hamiltonian matrices were used to study the quantum system. In this paper we study the paths of the zeros using some important types of matrices as: Vandermonde and Banded. This matrix belongs to a more restricted category of the matrices that can be used to understand the behavior of the d paths of the zeros of the finite quantum system. Vandermonde matrices exist only when d=3. When d>3 Vandermonde matrices are not periodic, unless the identity matrix, and therefore cannot be used for our situation. Needless to say that the evaluation of such inverse matrices is a key point to study for our quantum system. For example to find functions of a matrix, such as exponential functions (evolution operators) and logarithmic functions (entropies) is important for the study of quantum mechanical topics. This result can be used to improve the problem of the behavior of paths of the zeros which have properties uniquely determined by Banded and Vandermonde matrices. We prove numerically that the paths of the zeros under this quantum system produces graph which enable us to determine the acceleration and velocity of the system. The following question is examined: Is it possible to understand the paths of the zeros using these types of matrices (Vandermonde and Banded)? We will show numerically that there exist cases where the paths of the zeros of one Vandemorde matrix and one Banded matrix have the same multiplicity. In section II, we give a brief introduction in finite quantum systems. We introduce an analytic function for these systems. In section III we study the zeros of the analytic representation. The paths of the zeros during time evolution are considered. In the case of matrices with rational ratio of the eigenvalues (so that there exists t with exp (itM)=1) the system is periodic and the paths of the zeros follow a closed curve. Our new results are summarized in this section where we plot the paths of the zeros using Vandemorde and Banded matrices and explaining their importance. We assume that is an arbitrary normalized state. and therefore this function is defined in a cell. Where M and N are integers that defined the cell S. The analytic formalism of eqn. (4), can be used in order to study the completeness of finite sets of coherent states in the cell S.
In finite Hilbert space, the analytic function F (z) has exactly d zeros ζv in each cell S, and the following constraint. Here N is the integer that labels the cell (as in eqn. (8)), and is a normalization condition. Below we choose the cell with N=0. The proof of eqns. (8) and (9) is given in refs. [22-24]. Let M be a matrix of the system (a d × d Hermitian matrix Mmn). As the system evolves in time t, each zero ζv follows a path . The proof of eqns. (10)-(13) is given in ref. .
Based on general eqn. (10) we generate the paths of the zeros. The paths of zeros which are satisfied by eqn. (15), are shown in Figure 1. 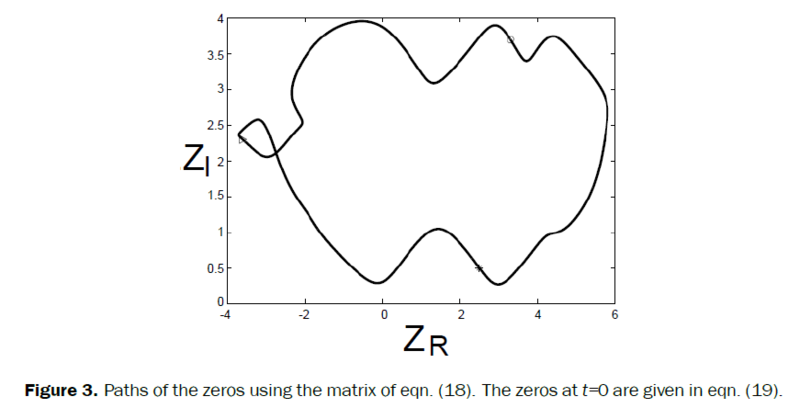 In Figure 1 using the zeros of eqn. (15) with the Vandemorde matrix eqn. (14), it can be observed that the zeros follow a closed path, resulting to . As a result, the multiplicity of the path of the zeros equals to 3, (M=3). In the graph it can be seen that the ζ0 (t) after a period of t=2π occupies the position of the ζ0 (t). For the ζ1 (t) after a period of t=2π occupies the position of the ζ2 (0) and finally for the ζ2 (t) after a period of t=2π occupies the position of the ζ0 (0). The ZR values (real the values of the zeros) are represented in the horintal axes. The ZI values (imaginary the values of the zeros) are represented in the vertical axes. Figure 1: Paths of the zeros using the matrix of eqn. (14). At t=0 the zeros are given in eqn. (15). In a period of 2π, using the zeros of eqn. (17) and Vandemorde matrix of eqn. (16), the zeros follow their own path with a multiplicity equal to 1, (M=1). In Figure 2 the paths of these zeros are demonstrated. 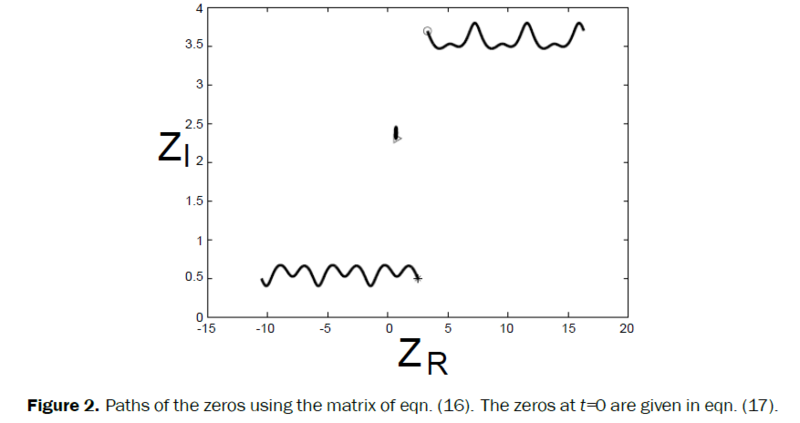 Figure 2: Paths of the zeros using the matrix of eqn. (16). The zeros at t=0 are given in eqn. (17). The paths of zeros using the zeros in eqn. (19) and the matrix of eqn. (18), are shown in Figure 3. It can be concluded that the zeros follow a closed path, resulting to . Therefore, the multiplicity of the path of the zeros equals to 3, (M=3). Using the zeros of eqn. (15) and the Banded matrix of eqn. (18), the paths of the zeros are shown in Figure 3. Figure 3: Paths of the zeros using the matrix of eqn. (18). The zeros at t=0 are given in eqn. (19). We have studied quantum systems in d - dimensional Hilbert space with phase space Z(d) × Z(d). In eqn. (4) an analytic representation of these systems in terms of Theta function is defined. In finite quantum systems the d zeros defines the quantum state uniquely. The d paths of the zeros are used to describe the time evolution of the system. Using eqn. (10) we produce the paths of the zeros. The motion of the d paths of the zeros using special case of matrices is studied. Some examples of the paths of the zeros using Vandemorde and Banded matrices are given. There is a connection between the zeros of analytic functions and the quantum systems. In finite quantum systems the zeros define the state of the system and the paths of the zeros are in d paths on a torus. The Hamiltonians that we are using are periodic so the zeros follow closed paths. Our goal was to find specific cases of matrices that we can explain in more detail the behaviour of the paths of the zeros. We have assumed that there exist specific cases of periodic Hamiltonians which give as better understanding of the behaviour of the paths of d zeros (Appendix). In conclusion we have study the quantum systems by looking at the behaviour of the paths of the zeros. This is important because if we know the behaviour of the paths of the zeros we will be able to find the acceleration and the velocity of the paths of the zeros. That means we can understand the quantum system completely when the time evolves. We have produce results using Vandemonde and Banded matrices for first time. The contribution of this work since these matrices produces new type of solutions which can have physical meaning. Stovicek P and Tolar J. A classification of finite quantum kinematics. Rep. math. Phys. 1984;20:157. Tolar J and Hadjitaskos G. Particle Statistics from Induced Representations of a Local Current Group. J. Physs. 1997;A30:2509. Vourdas A. Quantum systems with finite Hilbert space. Rep. Prog. Phys. 2004;67:267. Vourdas A. Quantum systems with finite Hilbert space: Galois fields in quantum mechanics. J. Phys. A: Math. Theor. 2007;40:R285. Cotfas N and Gazeau JP. Finite tight frames and some applications (topical review). J. Phys. 2010;A43:193001. Chadjitaskos G and Tolar J. Feynman path integral and ordering rules on discrete finite space. Int. J. Theor. Phys. 1993;32. Bergman S. The kernel function and conformal mapping. Amer. Math.Soc, Rhode island. 1970. Hall BC. First summer school in Analysis and Mathematical Physics. Contemp. Math. 2000;260:1. Vourdas A. Analytic representations in quantum mechanics. J. Phys. A.Math. Gen. 2006;39:R65. Evangelides P, et al. Analytic representations with theta functions for systems on Ã¢ÂÂ¤(d) and on Ã¯Â¿Â½Ã¯Â¿Â½. J. Math. Phys. 2015;56:072108. Bargmann V. On a Hilbert space of analytic functions and an associated integral transform Part II', Com-mun. Pure Appl. Math. 1967;20:1002. Vourdas A and Bishop RF. Thermal coherent states in the Bargmann representation. Phys. Rev. A. 1994;50:3331. Bargmann V. On a Hilbert space of analytic functions and an associated integral transform part I. Commun. Pure Appl. Math. 1961;14:187. Harkness J and Morley F. Introduction to the theory of analytic functions, G. E. Stechert and Co, New York, 1924. Bak J and Newman DJ. Presents the solution of the cubic equation and Newton's method for approximating the zeroes of any polynomial. Complex analysis, Springer-Verlag, New York, 1982. Hille E. Analytic function theory, Introductions to Higher Mathematics. 1962. Eissa H, et al. Paths of zeros of analytic functions describing finite quantum systems. J.Phys.Lett. A 2015;11:032. Tubani M, et al. Zeros in analytic representations of finite quantum systems on a torus. Phys. Scr. 2010;82:038107. Zhang S and Vourdas A. Analytic representation of finite quantum systems. J. Physics. A, Math. Gen. 2004;37:8349.